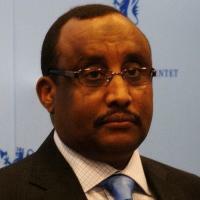 Abdiweli Mohamed Ali was appointed Prime Minister of Somalia on June 23, 2011, and received an overwhelming victory. He was the director of the tax department at the Ministry of Finance and Revenue from the mid-to-late 1980s. From 1988 to 1991, he was an assistant director at the Research and Statistics department at the Ministry of Finance and Revenue. After that, he immigrated to the United States to continue his higher education. He received his master's degree from Vanderbilt University in Nashville, Tennessee in 1988 and then obtained another master's degree in public administration from Harvard University in 1999. He received his Ph.D. in economics from George Mason University in Virginia in 2000. In 2003, Ali taught economics at Niagara University in New York until he joined Somalia's transitional government as deputy prime minister and minister of planning and international cooperation. Ali is highly experienced in academia and academic research, development and economic politics as well as financial and public administration. He worked for several international agencies including The World Bank and the United Nations Development Program (UNDP). He is credited for devising Somalia's now-successful peace process, mostly referred to as the "Roadmap to End the Transitional period". With strong international support and a nation yearning for peace, Dr. Abdiweli devised the implementation plan for executing this political process which has now set the country for new political dispensation. Ali is originally from the autonomous Puntland region in northeastern Somalia.He holds both Somali and American citizenship. He is multilingual, being fluent in Somali, Arabic, Italian and English. He is married to Dr. Hodan Isse, a University at Buffalo Economics professor and founder of HEAL, a Buffalo-based NGO. The couple have four children.